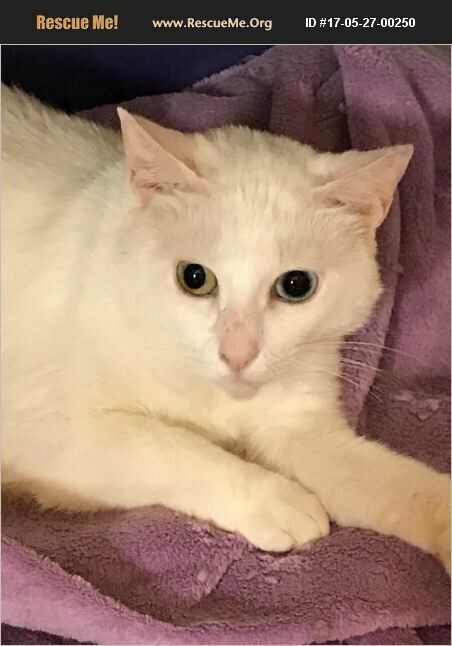 This gorgeous all white cat was living under a U-Haul truck at a busy shopping center, located in Miami, Florida. She is approximately 5-7 years old and already spayed. She has been to my veterinarian at Pines West Animal Hospital in Pembroke Pines, Florida and was given a clean bill of health. This feline must be the only animal in the home, because I witnessed other cats beating her up. She is very submissive yet very affectionate and loving. She also has one green/gold eye and one blue. She is living in a cage now and is not happy but she is safe! Please contact me via e-mail through Rescueme.org.